Looking for a quick and easy party snack? Try sweet and sour meatballs, bacon deviled eggs, or these festive shrimp bites. I cannot believe that summer is almost here! I’m definitely looking forward to the warmer weather and spending time at the pool and the beach. We have the perfect yard for entertaining and in the summer we often host parties for our family and friends. As much as I like to cook, when I have people over I try to minimize my time in the kitchen – I’d much rather be spending time with my guests! When I’m looking for quick and easy entertaining solutions I turn to simple yet flavor packed appetizers like these Mexican shrimp bites. This recipe hack is a dressed up version of the more traditional guacamole and chips snack that can be put together in minutes. How do you make Mexican shrimp bites? I love being able to take a few simple ingredients and turn them into something incredibly delicious. 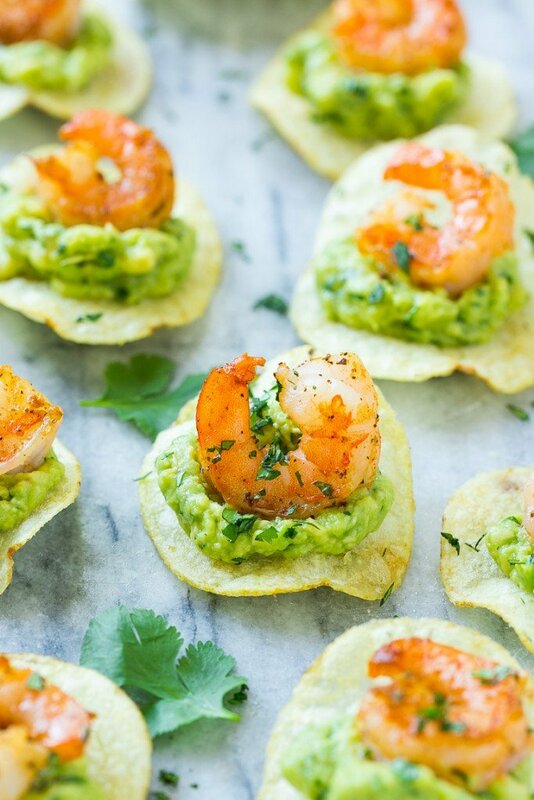 These shrimp bites are simply seared shrimp and guacamole layered on top of Lay’s Classic potato chips. It’s such a great combination of flavors and textures, and the potato chips are the perfect base to hold the toppings. These shrimp bites look fancy because they’re served canape style, but they take just minutes to put together. The first component of this recipe is the shrimp – you’ll want a small to medium sized shrimp that will fit on top of the potato chips. The shrimp are seared with a bit of olive oil and chili powder for added flavor. Next up is the guacamole – I typically buy a high quality guacamole at the grocery store, but you could also make your own if you like. 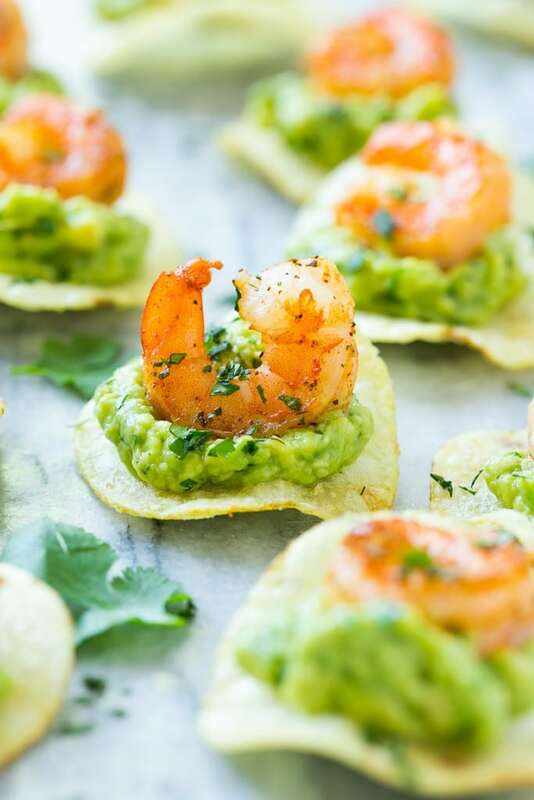 I chose Lay’s Classic potato chips to hold the shrimp and guacamole because they’re my favorite – the chips are well seasoned and have a satisfying crunch. 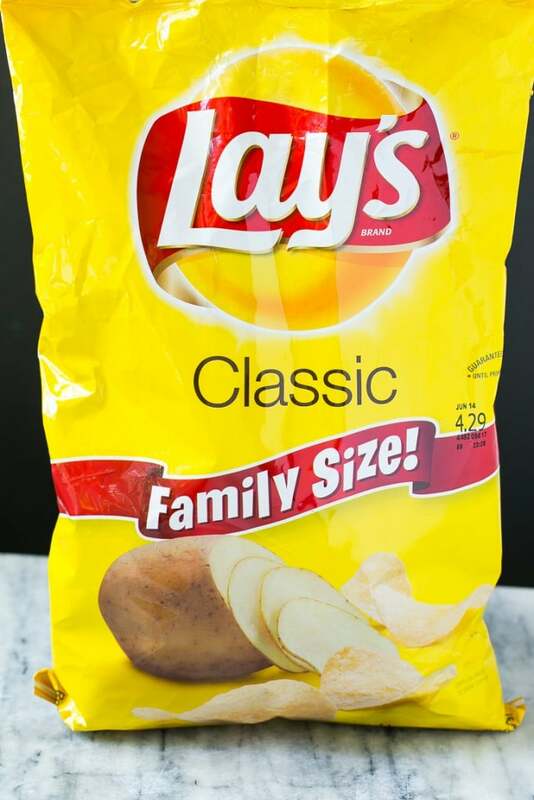 You can really use any type of Lay’s potato chip that you like, Wavy Lay’s potato chips would also be a good choice. After you’ve layered the shrimp and guacamole onto the chips, add a bit of cilantro if you like, put them on a tray and watch them disappear! This recipe can easily be doubled or tripled for a large crowd. 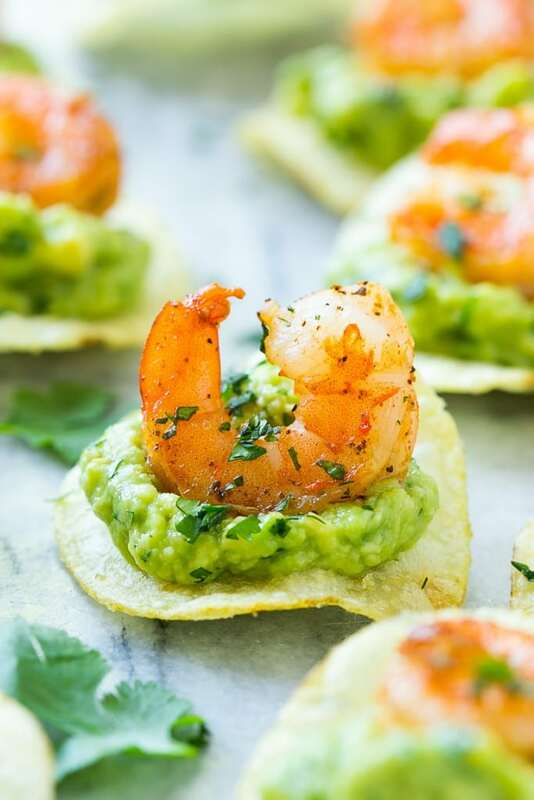 To me these Mexican shrimp bites scream summer, there’s nothing like sitting outside enjoying the weather with some chips and guacamole – this is a slightly different take on the classic that your guests will love. 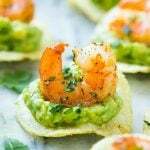 This recipe for Mexican shrimp bites is seared shrimp and guacamole layered onto individual potato chips. A super easy appetizer that's perfect for entertaining! Heat the olive oil in a large pan over high heat. Sprinkle the chili powder over the shrimp. Place 18 potato chips on a platter. Spoon approximately 2 teaspoons of guacamole onto each one and place a shrimp on top of each chip. Serve, garnished with cilantro if desired. This post has been sponsored by Frito-Lay. All thoughts and opinions are my own. Thank you for supporting the brands that make Dinner at the Zoo possible! These look amazing and I just stocked up on avocados. Could the shrimp be made a day ahead, refrigerated and then assembled for a room temp app the next day? Yes that would definitely work! I have never had an issue with them getting soggy, but you’re right, they never tend to last that long so I haven’t done any testing on that! Thanks for replying so promptly! I guess the speed at which they will disappear depends on how many other appies I’m serving at the same time! ???? Do the chips get soggy? I haven’t experienced an issue like that, you could always try something sturdier like a tortilla chip too! I am looking for a make ahead appetizer…..could this be on a crostini—-the day before? I think the avocado would turn brown if you made it the day before, so this likely wouldn’t be a good candidate for a make ahead appetizer. These look Great! I’m thinking of trying them with scoop-type tortilla chips. I made these last night for a party and they were a hit! I tried half with the lays and half on a tortilla chip. Both disappeared! Can you bake the shrimp? Thank you! I can not wait to try them. There can never be too much shrimp and I love this spicy version, Sara. Perfect and easy for entertaining! Those bites look ridiculously good and your photos are stunning, makes me really hungry and craving. I could eat as a meal every day for the rest of my life. Oh now I would love these! What a perfect bite that would please everybody. You are so creative and the photos are gorgeous! These are some good looking appetizers that would be great with a frosty mug of beer! 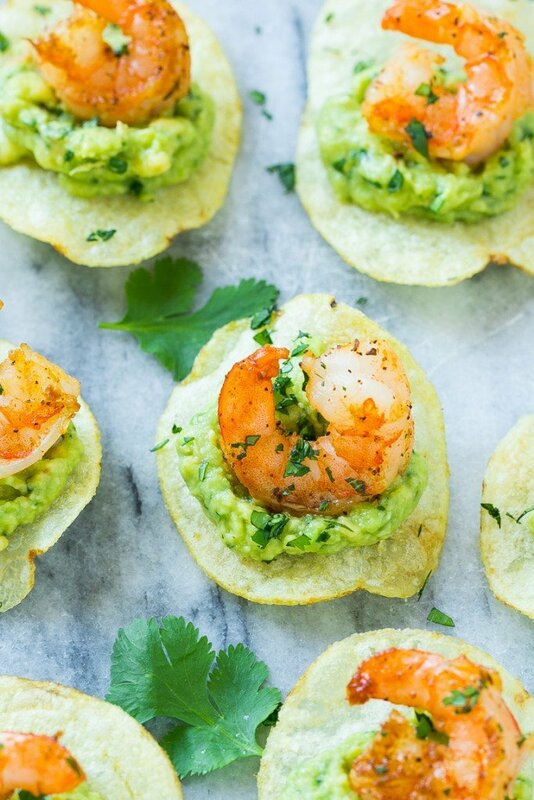 Lay’s chips, guacomole and shrimp… what could be more yummy! What a great easy recipe for impromptu gatherings. They look delicious. Beautiful and they sound incredibly delicious! I love that you’re taking advantage of pre-made guacamole – it makes this doable and easy enough for throwing together at the last minute! What a great easy idea for chips that I always seem to have on hand!